Prepare the squid and wash well. Cut the mantle into rings, and cut the arms/tentacles into blocks consisting of 2 or 3 arms/tentacles. Cut the daikon into about 1 inch thick slices. Add the sauce ingredients to the dashi soup stock and heat. Once it starts to boil, add the squid and simmer for 1 to 2 minutes. Remove the squid. Add the daikon to the sauce. Cover with an otoshi-buta (a drop-lid) and simmer over medium heat. 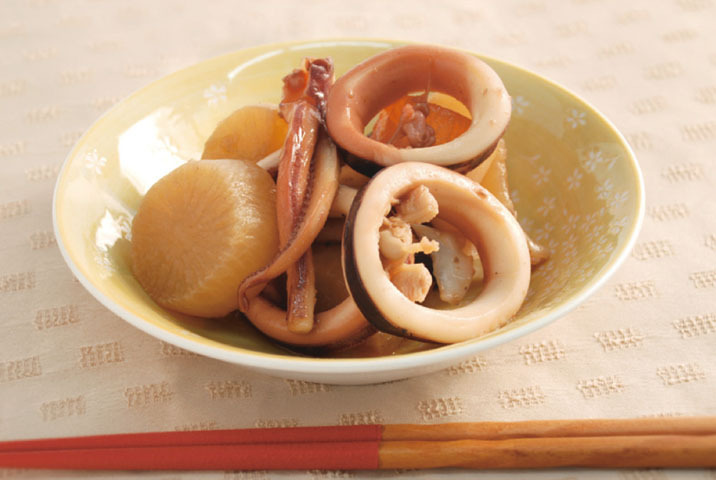 Once the daikon becomes tender and the liquid is thickened, add the squid. Tilt the pot to fully coat the squid with the sauce.